C oral bleaching is fundamentally a single-celled process happening on a massive scale. Bleaching typically originates in one area of a coral before it spreads, and symbionts are progressively lost or discharged from the host animal over time. This sequential process is indicative of the individualised struggle of each cell as they fight for survival against external stressors and suggests the presence of sub-niches within the coral tissue. To avoid such potentially confounding factors in a bleaching study, it is necessary to reduce the complexity of the system to its minimum relevant component: the cell. I n this project we used laser confocal microscopy to investigate ROS, glutathione, lipid peroxidation, mitochondrial integrity and cellular activity in endoderm cells and symbionts extracted from healthy corals and corals exposed to thermal stress. 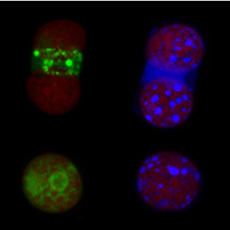 Coral endoderm cells with symbionts (top) and free symbionts (bottom) stained with fluorescent dyes for ROS (green) and glutathione (blue).